Divide the whole world into two parts - dog people and cat people. 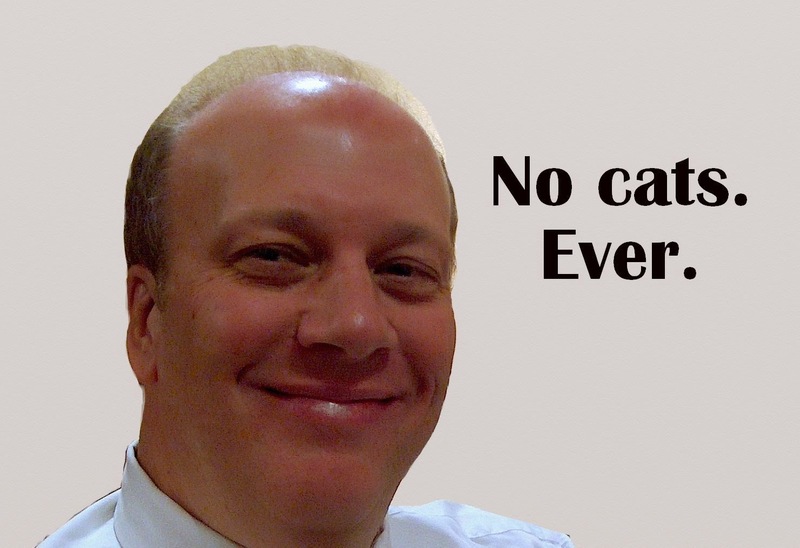 At the time my husband and I were seriously dating, Mark was undeniably a cat person. The proof was his two cats: Stumpy and Barefoot. Stumpy was your run of the mill American Shorthair cat - grey tiger striped, with a bobbed tail that earned him his name. Actually, if you felt his tail you would find that the bone had curled up. It was weird. Barefoot was Stumpy's brother. He had white patches on his feet and a more than average amount of cat aloofness. I irritated Barefoot by my mere presence in the world (stand in line, cat - stand in line). Mark lived in a condo about seven or eight miles from my house, so we saw each other most days. Occasionally, I'd go to his place. Barefoot gave me the evil eye the whole time I was there. He wanted to make sure I didn't stink up the place, I"ll wager. Cat radar was on alert. Once, I used future hubby's pillow to lay down. Later that night, after I left, future hubby went to bed. As usual, the cats jumped on the bed, but this time, Barefoot decided that the pillow that smelled like me needed hosed down. He had never done anything like that before; and Mark's head was on the pillow at the time. If I ever have access to a time machine, I do want to go back and see that moment. Someone remind me, if I forget. Mark is usually pretty patient and calm, but I'll bet you money those cats heard actual "language." Barefoot was "re-homed" soon afterwards. We married a few months later, and I wish I could have sent Barefoot an invite just to irritate him a little more. Stumpy was around for many years afterwards till the neighbors decided our flower beds made the perfect cat box for their many unkempt idiot cats. We tried everything to get them to stop, to no avail. The potty mulch felines were the bane to Stumpy's existence; he would go to the bay window and make demonic cat sounds. Then one day, he decided that the cats might not realize that was his area. Remembering Barefoot's clever way of declaring geographical superiority, he hosed the carpet in front of the window as he watched the nightly bathroom break of the idiot cats. Stumpy was "re-homed" when he couldn't nip that new habit in the bud. There are some deal breakers in my husband's play book. Mark the cat person was dead. He informed me briskly, "No more cats!" "Hey, man - I'm a dog girl, " I responded and pointed to Ginger and Cleo, our two dogs that were more than willing to fill the void. I've kept up my end of the bargain. Use red pepper or hot red pepper on the area and cats will leave it alone. Of course, you have to redo it after a rain. But, it works. Ah, Linda...that ship has truly sailed...on a river of cat urine.